How do you make your paintings look more professional? At some point in every artist’s development, you get to a stage where your paintings are looking pretty good. You’ve got a basic understanding of colour mixing, paint application and your drawings are sound. But some tricky subjects still elude you. And you begin to wonder, is it just me or are there painting techniques that I haven’t mastered yet? 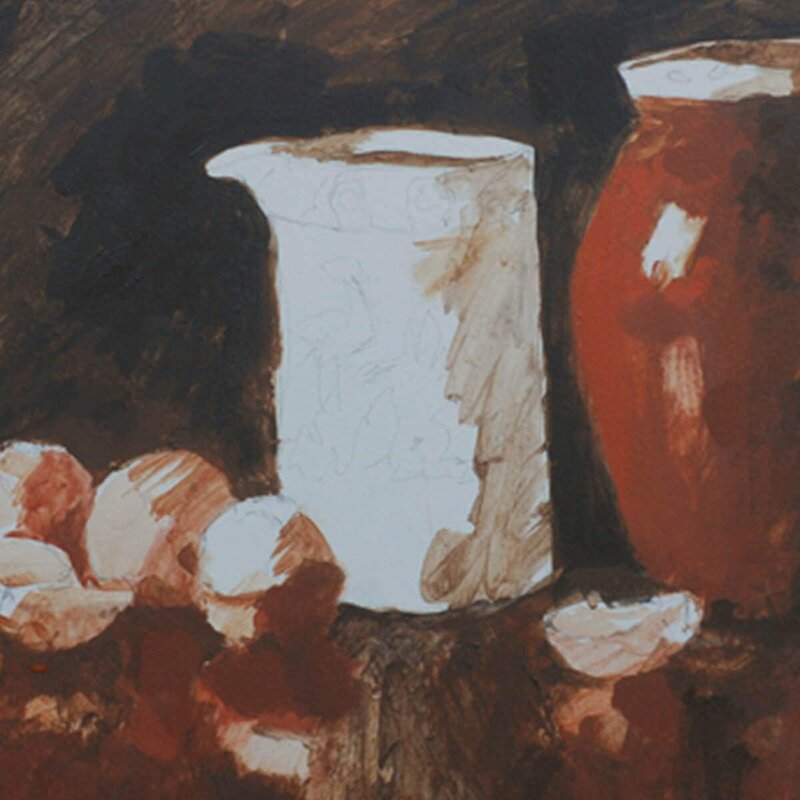 This acrylic still life course looks at the more complex subject of painting reflective surfaces such as silver, ceramic and mahogany. Over 3 hours of tuition, you’ll be guided through 3 studio based, full-colour acrylic paintings from start to finish. 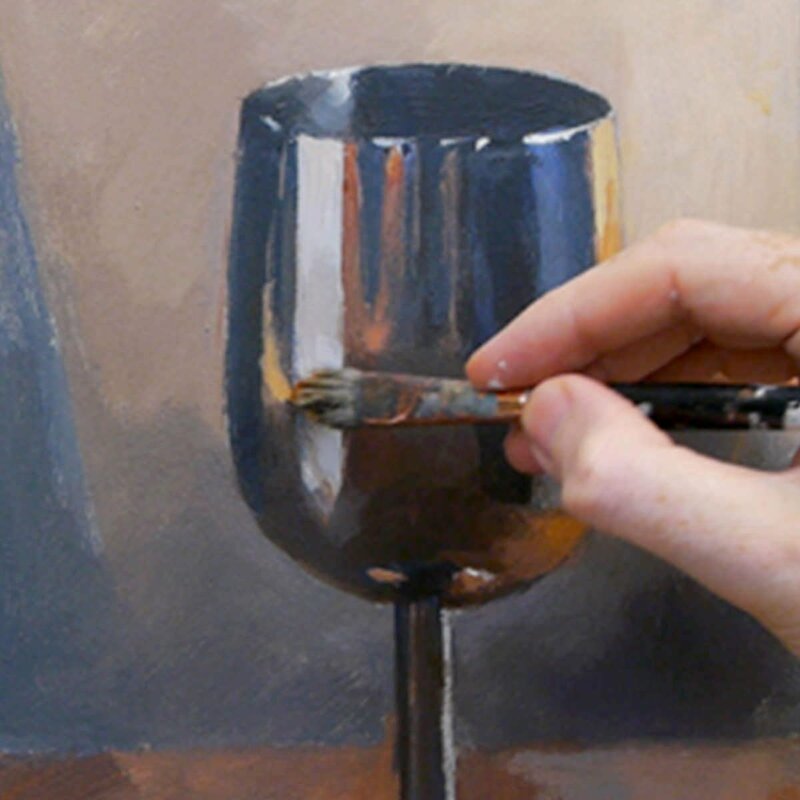 You’ll begin the process with a silver goblet painting using just two colours, followed by a more challenging still life using a wider range of pigments and optical glazing techniques. Plus a bonus lesson of a small coloured glass study. This additional lesson tackles how to add sheen to glass and realistic reflections in wood, whilst still achieving a painterly feel. Working through these simple step-by-step tutorials, you’ll learn how to use classical oil painting techniques, achieve realistic paintings that still have a sense of flair and expression and bring your paintings to a more professional finish. This course tackles the tricky subject of painting reflections in Silver, Ceramic, Mahogany and Glass. Sometimes all your painting needs is a few subtle touches to transform it. Taking a limited palette you’ll learn how less is more when trying to create the illusion of metal with acrylics. Building up the painting from the darks to the lightest sparkling reflections, you’ll see how the real skill is looking for the ‘abstract’ within the object to be able to paint it realistically. The bonus lessons look at ways of achieving lifelike glass with acrylics yet still having a painterly feel. This indirect method of painting allows you to follow the ‘course’ chronologically to accomplish a new level of painting. 1 x main still life subject from start to finish, based in the studio working from a reference image. 1 x study painting of a silver goblet using only two colours. 1 x BONUS painting- Small Glass Course (previously £18.50). Downloadable video lessons, split into separate chapters that follow on sequentially. Each stage a detailed yet easy-to-follow process. Downloadable jpeg reference images and reference line drawings. Printable Class materials list, 3hrs of detailed video instruction. A visual introduction to all the materials, paints, mediums, palettes and canvas for the course. Using a limited palette you’ll learn how to balance warm and cool tones and discover how “less is more” when trying to create the illusion of metal with acrylics. The importance of selecting the ‘right’ colour ground for rapid blocking-in of the first stages when we establish the darks. Choosing the right pigments for balancing a harmonious colour scheme.Learning about ‘edge control’ to add 3-dimensional form to objects and controlling the viewers gaze. Using modern pigments with classical oil painting techniques to bring a sophisticated finish to the painting using subtle glazing. Being selective with composition, laying down a coloured ground and observing the key points for our drawing of the small glass study. Introducing lights and contrast by adding an opaque Titanium White. 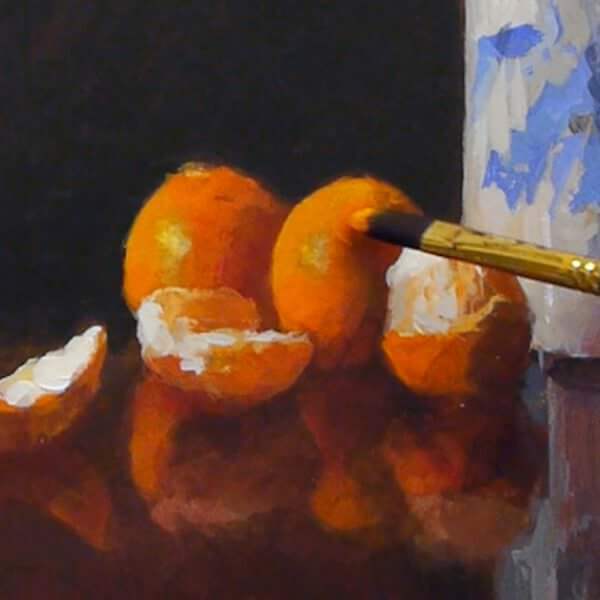 Using a vivid Cadmium Orange, and learning how a cup of tea can add new insights to your painting! Bringing the study to a finer finish by unlocking techniques to add a new level of sophistication, including how to add sheen to glass and creating realistic reflections in wood. I’ve taken care to film everything from my perspective so you can see exactly what I’m doing as we go through the entire painting process in real-time. With over 3 hours of video instruction, full-color photographs and drawing guides. When you purchase the course, you will receive an email with all the downloadable video links to the course. You then have to download and save the Video Lessons onto your home computer/iPad. 9 Downloadable Step-by-Step Video Lessons. Over 3 hours of detailed video instruction that once downloaded – you have anytime, anywhere access. JPEG reference images used throughout the course, including the photo reference I demo with. BONUS – Small Glass study video course. The video files are large (2 GB in total) so you need a broadband internet connection and enough space on your computer hard drive. I filmed, edited, and coloured the course myself (with a little help from Vanessa!) rather than working with a production company. Artists have different needs than editors so I wanted to cut the course like an artist, showing you exactly what I wanted to see when I was learning. I show all the real-time brushstrokes for the paintings so you don’t miss a step. An over-the-shoulder view of the work – so you can see how I build up the painting as if you were standing behind me in the studio. 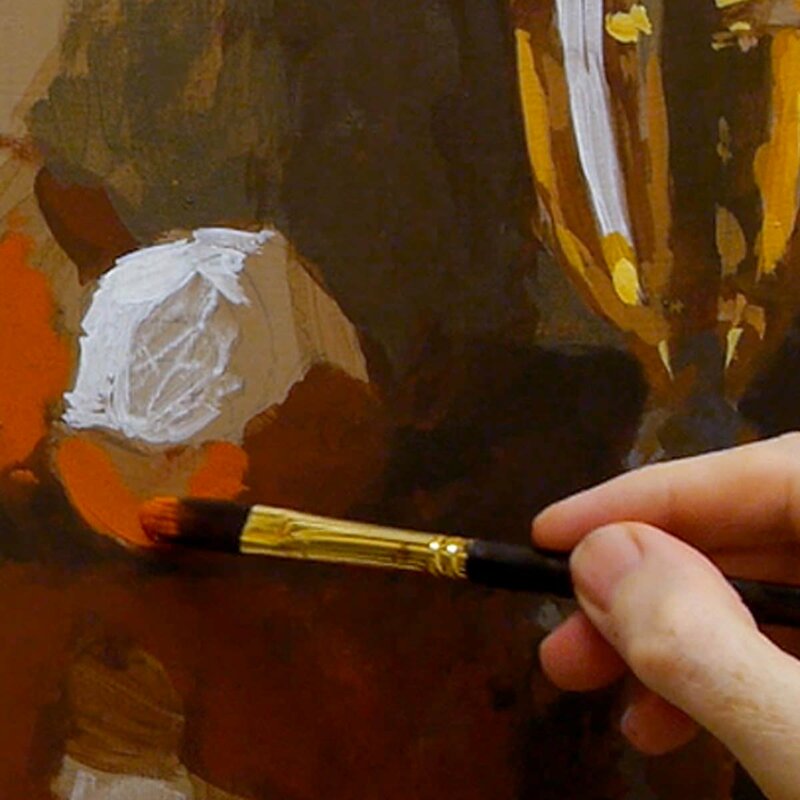 A close-up of the brush contacting the canvas – with extreme close-ups, so you can see the grain of the canvas and the bristles in the brush. Stable shot of the palette for when I pick up paint – see exactly how I mix colours. There is nothing worse than when the brush disappears from view, only to reappear with some fantastic new colour. Where did that colour come from?! How did it get mixed? The palette view is very important, and not just at the beginning of the video. I want to show you every single mix I make, so I film with the palette directly next to the painting, then you can see shots of the palette throughout the course and gain a sense of my approach to colour mixing. I don’t like long jumps in progress when the paintbrush goes off camera, the shot changes and suddenly the picture has seemed to drastically improve. I include all the stages so you can clearly see the progress of a work. 30 mins – 2 hr per session, You’ll need to be able to dedicate between 30 minutes to 2 hrs for each section, for example, the blocking in might take 10 minutes, but the painting of the leaves may take a couple of hours. Will, I really enjoyed this course and learned loads. I didn’t realize just how useful the glazing liquid could be. Thanks for all that you share on your site – that’s where I’ve learned to paint. I’ve attached a photo of each of my paintings. They’re a huge step forward for me so thanks again. Just thought I’d drop a note to relay that I love the new Acrylics master course. I’ve watched through all of the videos and tonight I made an attempt at the silver goblet exercise. I’m pretty happy with my first attempt at painting a reflective surface. I love your site and your approach to teaching. The detail you go into it fabulous and you make it feel like I’m warmly welcomed into the studio for a lesson. It’s much appreciated. Yes, there are jpeg reference images and line drawings to work from. I’m a big fan of drawing, and if you have a good understanding of how drawing works, it can make the biggest jump forward in your paintings. But if you’re super keen to get started with painting and engrossed in colour, then I’ve added a few downloads to help you out. I’m a big fan of drawing and if you have a good understanding of how drawing works, it can make the biggest jump forward in your paintings (it seems counter-intuitive but it can make dramatic changes). But if you’re super keen to get started with painting and engrossed in colour, then I’ve added a few downloads to help you out. These are line drawings that you can work from. All of the images can be printed out A4 size so you can work 1:1 with your reference image (another classical technique called ‘sight-size’). You can then draw out freehand or trace the lines to get you started, this course is all about getting you painting. What skills should I have already coming into this class? A love of tea and biscuits, coffee and cake for those well-earned breaks away from the canvas. What if the course is too advanced for me? I’m only a beginner, will I be able to follow the steps? All of the stages are very simple. Even though the course is called a masterclass, it’s all about progress. Sure, your colours might be a little different, the drawing may go a little out, and the underpainting may be a bit too thin. But these are all very small changes, the principles are still being developed and learnt, so even if you’re going ‘wrong’ you’ll still be developing as a painter. The first tutorial of the silver goblet only uses a couple of colours and then we progress these ideas onto the more developed main painting. What if I can’t find the time? How many hours will the painting take? The video course is self-paced. I’ve structured the lessons into easy-digestible ‘painting chunks’ so you can paint each section at a time to fit into your lifestyle. If you have to break for a few days before you can get back to the easel, no problem. Once downloaded the course is yours to keep forever so there isn’t a time limit. If you’ve painted a couple of still lifes but want to tackle a more challenging subject. This course is aimed at someone who has painted a couple of pieces, knows they can improve but doesn’t know how to make the transition to a more refined painter.